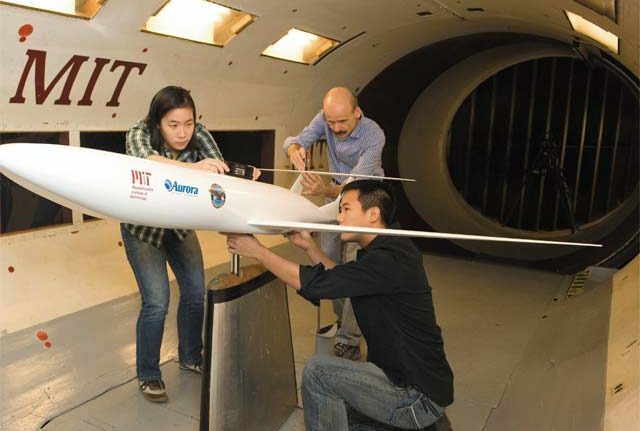 A team of MIT students designed this aircraft model for Nasa. High-tech ‘soap bubble’ concept could result in a dramatic reduction of airliner fuel consumption while also lowering emissions. In what could set the stage for a fundamental shift in commercial aviation, an MIT-led team has designed a “green” aircraft that is estimated to use 70 per cent less fuel than current planes while also reducing noise and emission of nitrogen oxides (NOx). The design was one of two that the team, led by faculty from the Department of Aeronautics and Astronautics, presented to Nasa recently as part of a R21 million research contract to develop environmental and performance concepts that will help guide the agency’s aeronautics research over the next 25 years. Known as “N+3” to denote three generations beyond today’s commercial transport fleet, the research programme is aimed at identifying key technologies, such as advanced airframe configurations and propulsion systems, that will enable greener aircraft to take flight around 2035. The MIT team met Nasa’s challenge by developing two designs – the 180-passenger D “double bubble” series to replace the Boeing 737 class aircraft, currently used for domestic flights, and the 350-passenger H “hybrid wing body” series to replace the 777 class aircraft now used for international flights. The engineers conceived of the D series by reconfiguring the tube-and-wing structure. Instead of using a single fuselage cylinder, they used two partial cylinders placed side by side to create a wider structure whose cross-section resembles two soap bubbles joined together. They also moved the engines from the usual wing-mounted locations to the rear of the fuselage.